An exhibition of works by painter, illustrator and cartoonist Cathy Simpson. A recent migrant to the Hastings area, Cathy has found it totally inspirational. Her exhibition is entitled âTwitterings and Catcreeps' in deference to the twittens and cat creeps which are so much a feature of Hastings Old Town. What all these pieces have in common is that they are designed to raise a smile. 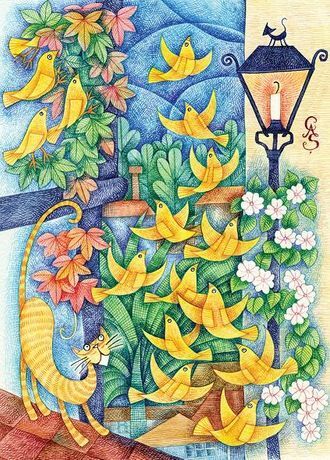 Cathy wants the viewer to enjoy looking at them as much as she enjoyed making them, and delight in colour, decorative pictorial design and delicate mark making.